Looking for a Movavi Video Converter alternative? Here this article will tell you a similar software, which not only works as an alternative to Movavi Video Converter, but also has more powerful functions than it. Wondershare UniConverter for Mac (originally Wondershare Video Converter Ultimate for Mac) (Wondershare UniConverter (originally Wondershare Video Converter Ultimate)) is absolutely the best Movavi Video Converter alternative. 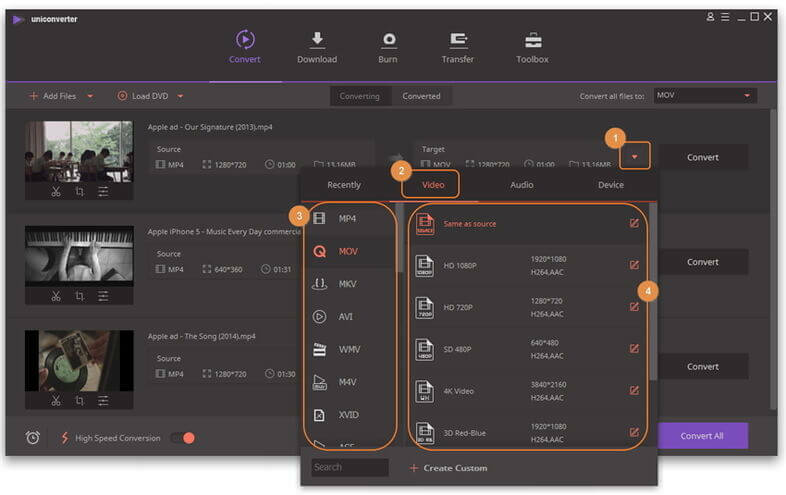 You will be impressed by its 30X faster speed, lossless video conversion, smooth conversion process, the various formats supported and your initiative for video customization. What's more, we provide you other free alternative and online solution. Best Movavi Video Converter alternative to convert videos in any format with 30X faster speed and full quality output. Convert video to over 1,000 formats, including MP4, AVI, WMV, FLV, MKV, MOV and more. Edit videos with Crop/Trim/Rotate and other personalize features with built-in video editor before converting. Transfer videos from PC/Mac to iPhone/iPad/iPod/Android devices with a USB cable. 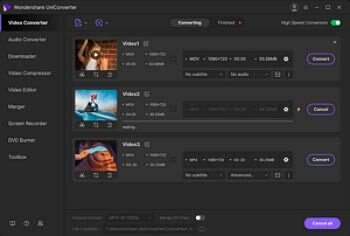 Versatile toolbox combines fix video metadata, GIF maker, cast video to TV, VR converter, screen recorder, etc. 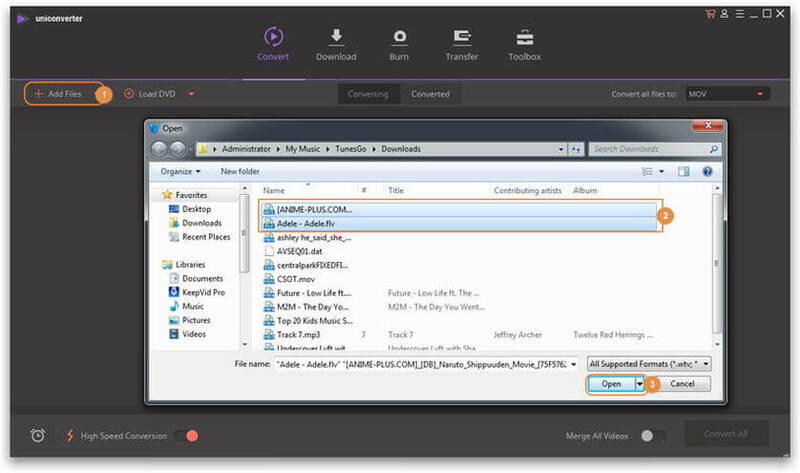 The Movavi Video Converter Alternative excels in many ways. Here are some top advantages that it has over its competitors. Please see the facts below to find out how. Lossless Conversion. With this great program you can convert a file from one format to another at 30X faster speed. You can ensure the quality stays just as good as the original with the same characteristics and the same bit rate, resolution, frame rate and more. Support Massive Media Formats. With Movavi Video Converter alternative, you can open just about any type of video file and then convert it to the type of format that you desire without any quality loss. Plus it can make it possible for you to watch your video on just about any device, including the iPad, iPod, iPhone, Apple TV, Android, Google Nexus and many more. User Friendly Interface. Users can add a file, pick the desired format, etc. with a simple to use interface. It shows the data on the screen where it is easy to understand. You don't need to spend time on learning how to use it. Its intuitive interface just tells you everything. Initiative for Personalization. It is also possible to produce custom presets by stipulating the different settings you prefer such as the resolution, bit rate or frame rate. Also this Application has a built-in video editor, you can personalize your video before conversion according to your taste. Here is an example of how easy it is to convert MP4 to MOV using Movavi Video Converter alternative. Follow the simple steps below. 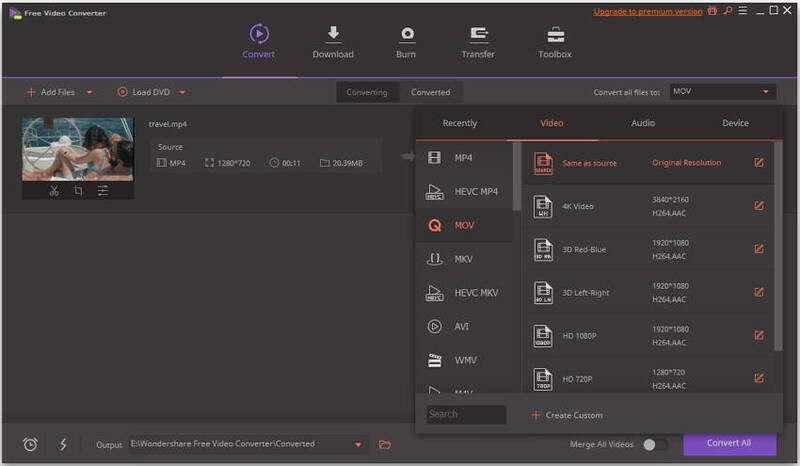 After downloading and installing the Movavi Video Converter alternative, import your MP4 files by clicking the button, or directly drag and drop your video to this application. Go to the Target section and click the drop-down button, then a drop-down list will appear with tabs of Recently, Video, Audio and Device. Just choose your desired format there, take MOV for example, go to Video > MOV and select the specific resolution in the right. Click the Convert or Convert All to initiate video conversion. As soon as the process finishes, you will find the files in the Converted tab. Other than the Wondershare UniConverter (originally Wondershare Video Converter Ultimate), there is another free alternative for Movavi Video Converter. The users can opt for Wondershare Free Video Converter for the purpose. This tool is used for the conversion of formats like AVI, MP4, MOV, FLV, MKV, 3GP, etc. It can also be used to download the videos from YouTube. Step 1. Download Wondershare Free Video Converter and install it on your system. Then launch it and a homepage will appear where you will see the Convert tab by default. Step 2. In the Convert tab, tap on the Add Files option or use the drag and drop method to load your video files. Step 3. All added files will be displayed as thumbnails where you can edit them optional. Then go to select the output format from the Convert All Files to drop-down menu, all available video/audio/device formats can be found here. Step 4. Tap on the Convert option in front of the file or the Convert All option at the bottom of the interface. If you want an online alternative that won't require any download then you have another option too. 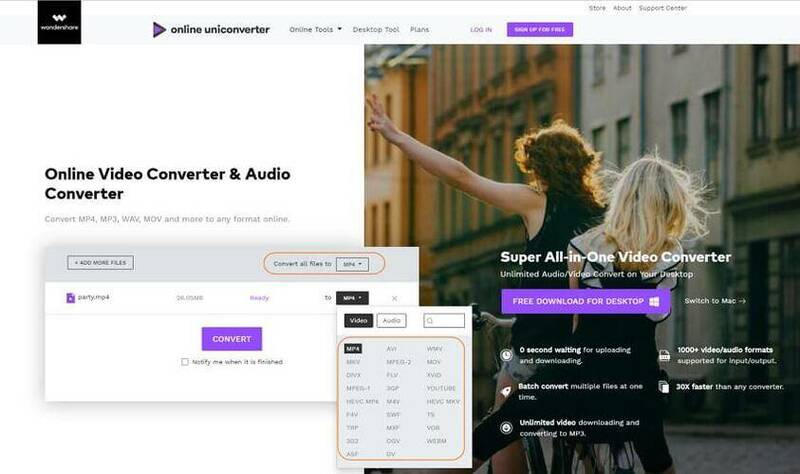 You can opt for the Online UniConverter (originally Media.io) for the conversion as an online Movavi video converter alternative. It supports most popular video formats such as MP4/MOV/MKV/AVI/WMV and more to convert easy and free online. You can also convert audio files with this online tool. Step 1. Open the Online UniConverter (originally Media.io) (https://www.media.io/) website and you will see the page where you can convert the videos. Tap on the Add your files option to load the files to the webpage. Step 2. Once the file is loaded, select the desired format from the Convert to drop-down menu and then tap on the Convert option. Step 3. The process will be initiated and a few minutes later you will have your video files in the required format. You can download the files by tapping on the Download All option. Step 1. Download the software on your system and install it. Then launch the software and its homepage will open up. Step 2. Drag the files from its location to the software interface and drop it. The file will be loaded into the interface. You can also tap on the Add Files option to open the files in the software interface. Step 3. Now, you will have to select the format in which you want to convert your video. You can customize the output format from the bottom section of the interface under the Video tab. Step 4. Tap on the Convert option at the right bottom of the screen and the process will start. Soon you will have your video in the required format. Now, we have discussed the variety of features provided by all the above-mentioned software. Every one of the software has the ability to convert video but comparatively the premium version of Wondershare Video Converter is the best choice for the users. So, if you want Movavi video converter 17/18 alternative then choose the software which combines all the amazing features of the converter, editor and burner, i.e. Wondershare UniConverter (originally Wondershare Video Converter Ultimate).